Welcome once again to the annual ComicBook.com Golden Issue Awards! Every year, the staff here at ComicBook.com takes a look back at the year as a whole and selects the best of what comics, movies, television, anime, and video games had to offer. All around television, and especially in our nerdy little pocket of the industry, women gave some absolutely jaw-dropping performances in 2018. This was the year that Doctor Who's Jodie Whitaker shattered glass ceilings, The Good Place star D'Arcy Carden portrayed every single lead character from the show in just one episode, and so many other fantastic actresses wowed audiences week in and week out. But, according to our Golden Issue voters, there was one performance that stood out among the rest. Victoria Pedretti, for her role as Nell Crain in Netflix's The Haunting of Hill House! 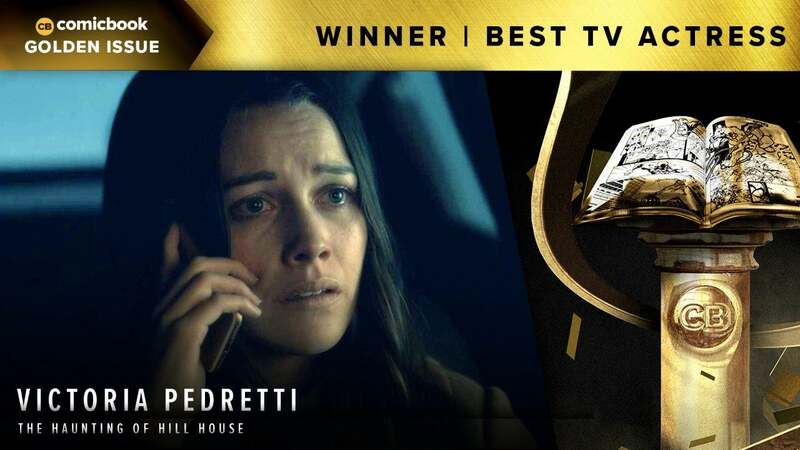 From the very first episode of Mike Flanagan's horror-drama, Pedretti absolutely broke our hearts. Nell was equal parts troubled and strong, and she carried more emotional baggage than perhaps any other character on TV this year. She was far and away the anchor of the entire ensemble, and the biggest moments of the series hinged on her performance. Fortunately Pedretti was consistently up to the task, always stealing scenes with her harrowing work. The pinnacle of Pedretti's performance came halfway through the series, during the episode "The Bent-Neck Lady." This was easily the most horrifying episode of the series, with a twist that changed the framework of the entire show, but it wouldn't have worked without the roller-coaster performance from Victoria Pedretti. She elevated an already great show to something truly special, and Nell Crain is a character we will likely never forget.